The Indian Air Force was officially established on 8 October 1932 as the air force of the British Empire. Currently, there are 1.40 lac soldiers working in Indian air force. By the number count, Indian Air Force is the fourth largest air force in the world. India’s neighboring country China has the world's second largest air force. In this article, we will compare the air force strength of the India, China and Pakistan. The Indian Air Force was officially established on 8 October 1932 as the air force of the British Empire. Currently, there are 1,40, 000 soldiers working in Indian air force. By the number count, Indian Air Force is the fourth largest air force in the world. India’s neighboring country China has the world's second largest air force and Pakistan have world’s seventh largest Air force. In this article, we will compare the air force strength of the India, China and Pakistan. 1. There are about 1.40 lakh soldiers in the IAF. 2. India has 1700 aircraft. 3. There are 900 combat aircraft in the IAF. 4200-9000 kms. at a time. 5. 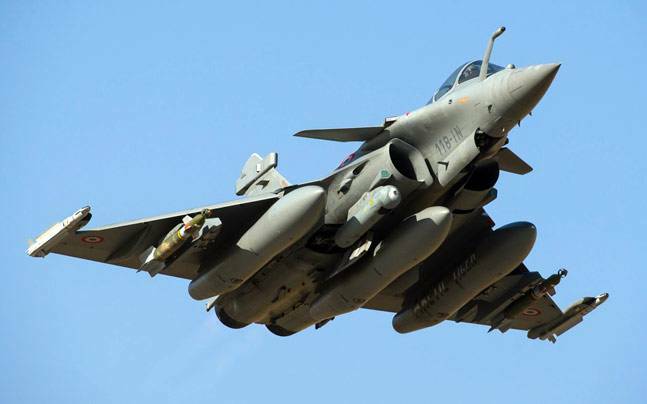 India and France have finalised the 36 Rafale Fighter jets deal. This deal will boost strength of Indian Air Force. 1. SU-30 MKI: This two-seater fighter aircraft given by Russia to India. Its feature is that it is capable of carrying medium-range Air-to-Air missiles. Its maximum speed is 2500 km/hr. 2. MiG-29: This two-engine and one-seated fighter aircraft is capable of flying at a speed of 2445 km per hour. It specializes in fighting up to a height of 17 km. It has a 30 millimeter range cannon, along with medium range radar driven missile system. 3.MiG-27: This one seater fighter aircraft is equipped with an engine. It is taken from Russia. It can fly at maximum speed of 1700 km / hour. It has 23 millimeter six-barrel cannon and also has the capacity to lift 4000 kilograms weight. 4. Jaguar: This aircraft belongs to combination of Indo-France technology. This two Engine Fighter Aircraft is capable of hitting the inside territory of the enemy. It can fly at the speed of 1350 km/ hr. It has 2 guns of 30 MM and capable of carrying additional weight (bombs and fuels) upto 4750 kgs. 1. People's Liberation Army Air Force is the world's second largest air force after the USA. 2. There are approximately 3,30,000 soldiers in Chinese air force "PLAAF". 3. China has 2800 main stream aircraft. 4. There are 1900 Combat Aircraft in the China Air Force. 5. Chinese Air Force has made 192 modern launchers. 6. China has S-300 ground-to-air attack missile system. 1. Pakistan Air Force is the seventh largest air force in the world. 2. There are 78,000 soldiers in the Pakistan Air Force. 3. It has 400 combats and 300 other support aircraft. 4. It also has MiG-19 and MiG-21-S aircraft. 5. If there is anything better in Pak than India, then it is the US-made F-16 Fighter Falcon Aircraft. Based on the data given above, it can be summed up that there is considerable difference in the capacity of the air force in India, China and Pakistan. China's air force is better than these two other countries but this does not mean that India's air force is weak. India's Air Force has won many wars for India on its own. Next Story How Silk is produced from Silkworm?